ROSEMARY'S BOOK CORNER: On Introducing Your Young Child to a Book Corner. On Introducing Your Young Child to a Book Corner. I believe that it is never too soon to start showing books to babies. Small babies like the movement of the pages and the sounds they make, just as much as they love being held closely. The tone of your voice and the colours and shapes will hold their interest. We all know the vital role books play in a young child’s life and how they can help with concentration; visual stimulation; language and listening skills and many more benefits. When a child reaches out and wants to hold his or her own book, the time has come to start planning a special “home” for the child’s very own books. This does not have to be elaborate in any way. 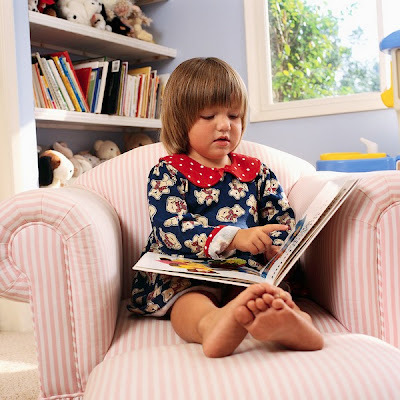 A big cushion on the floor and a large box or carton to hold the books safely, without getting them damaged, is quite sufficient, as long as the child can reach the books easily. You might want to clear the bottom shelf of one of your own book cases to house your child’s books. Or, as one of my daughters did for her little one, make and brightly paint a special bookcase for a corner in the child’s bedroom. Once again, the child must be able to reach the books and the experience must be cosy and inviting. Once this is set out, the child will quite happily go there alone, to “read” for short periods. When the first sign of this happens, some simple rules should be set, in a relaxed and happy manner. “Oh, good,” you might say “that’s a wonderful idea! I can see you have found your own special book corner. Now you can read your book and I will read mine”. Toddlers often have very short attentions spans, but most will sit for a while with a favourite book, just looking at the pictures. At the end of the little book corner session, it is important to make sure the books are returned to their box or shelf, preferably by the child. It is important too, to make sure that the reading activity does not involve any other activity at this stage – scribbling in books, tearing or cutting, is just not acceptable. So keep the crayons far way from the books, out of temptation’s way. Visits to the children’s section of your local library are also a wonderful way to introduce the child to a home book corner. I have found children well before their second birthdays, know just what to do and where to go in their own special section of the library. There are often comfy little chairs and tables for the children, or cushions on the floor. I think it is a good idea to let the child choose a book unaided. The big picture books might even be in a special basket at just the right height for the child. And children delight in finding a copy of a favourite “home” book on the library shelves. The child will sit down and page through the book, reliving the story that has been read to them at home. By introducing your child, carefully and lovingly to a book corner at home, you will be starting that child on the road to a life time of reading and enjoyment. Reading, as the child grows older, becomes a solitary pastime and pleasure, and it is never too early to lay the foundations for that satisfying experience. An Unusual Maths Lesson - Enjoy!